The port of Dammam on the Eastern Province of the Kingdom of Saudi Arabia, the home of the National Oil company Saudi Aramco, has seen tremendous growth over the last 30 years. To match this growth the King Abdul-Aziz Port of Dammam (KAPP), Dammam, has increased tenfold over the last decade to establish itself as a major maritime hub of the Arabian Gulf and the main gateway to the Eastern Province and the Capital Riyadh. It's location at the center of the Arabian Gulf and hinterland connections makes it an ideal choice for all connected to the Marine, Oil and Gas industry. Dammam Shipyard inside the Port of Dammam allows owners to repair vessels, Jack Up rigs or drilling platforms without leaving the Kingdom of Saudi Arabia's waters. For over three decades Dammam Shipyard has witnessed growth in facilities and recognition mirroring the popularity of Dammam as Saudi Arabia’s major port, numbered amongst the largest in the world. are currently running several Jeddah based projects from the Jeddah Islamic Port (ATCO berth) and the King Faisal Naval Base working with Saudi Aramco, Coastguard Royal Saudi Naval Forces (RSNF). Dammam Shipyard Offshore Division was established to provide repair services of Jack up in Arabian Gulf. Due to Dammam Shipyard' strategic location it is ideal destination for rig repair since the location is inside Kingdom of Saudi Arabia rigs does not require to have Aramco clearance to leave the kingdom for repair. Ship repair is at the core of Dammam Shipyards activity. Ranging from steelwork fabrication and ship conversion through to routine or unplanned mechanical..
Two large dry docks provide ample opportunity for essential underwater work to be completed under the watchful eye of experienced supervision.. In ship repair and maintenance terms, the Red Sea represents a mixture of local and passing trades that subdivide into a vast range of vessel types,..
We specialise in complex conversion and upgrade projects. Our comprehensive range of facilities, experienced management and motivated workforce are.. Specialist and general mechanical work covering main and auxiliary machinery is well within the capability of the Dammam Shipyard team of fully.. Hull damage can entail specialist skills particularly where it involves planned prefabrication prior to the vessels arrival..
Dammam on the Eastern Province of the Kingdom of Saudi Arabia. Al Blagha Group are currently running several Jeddah based projects. 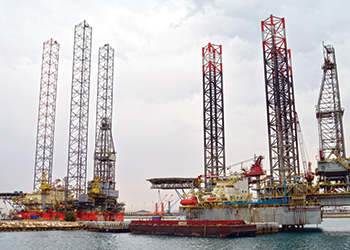 Dammam Shipyard Offshore Division was established to provide repairs for Jack up and Land Rigs in Arabian Gulf and mobile Engineering Services to Drilling and EPCI Companies based in the Kingdom of Saudi Arabia. Established in 1991 , the Al Blagha Group ( ABG) is a Saudi based Group of companies, focusing on the Marine Infrastructure, Port & Shipyard Operations, Marine Transportation and Logistics.